Make sure that filemanager window is refreshed after file is overwritten. When overwriting a copy of a file with an alias/shortcut of a file; the file icon is not refreshed in the file manager form element. Upon clicking the icon, the dialog that opens contains details of the copy of the file and not the shortcut/alias. A box.net repository is enabled or any other repository that supports shortcuts/aliases. 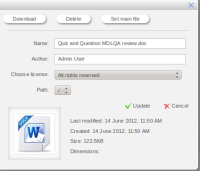 Log into Moodle as admin, teacher or any role capable of adding a file resource. Navigate to my private files and add a file, as a shortcut/alias, using file picker. Navigate to a course page and create a file resource. Add a file from box.net repository to the file manager form element using the filepicker, selecting to create a copy of the file. Add the same file to the file manager form element again, from the same repository, selecting the option to create a shortcut/alias of the file. The File icon appears as a shortcut/alias. Upon clicking on the file the details are displayed as a shortcut/alias. The file icon appears as a file, not a shortcut. The file details are those of the copy of the file and not the shortcut/alias.